Have a Happy Howl-A-Days from Lettie the Well Lit Dog! You see I was going to take this shot for a couple days and last night I thought why not do it now before the dog walk. I unwound the battery powered LED lights from the little Charlie Brown tree I have here and then wrapped the lights around the dog. Lettie is a very intelligent animal with a very "soft" personality. By that I mean she only does well if you speak softly to her, don't get upset, be gentle and maintain routine. She dislikes "weird". She will growl at things as simple as being pet "wrong". This was going to be a challenge. 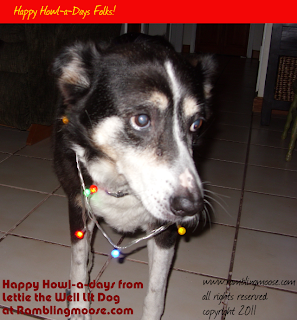 As soon as I wrapped the lights around her, very loosely I might add, she went into pouty dog mode. She kept coming back to me as if to hide. Dad, don't make me look like this. Take it off. NOW! Trying to get her to sit was a trial. She had to be put into the right pose. She would not stay there and immediately got up and came over as if to say "Hey big guy, this stuff looks stupid, take it off now!" I pushed her onto her sit position. I put her on her Mat. I walked over to get a little distance to frame the shot. So after about 20 pictures, none of which worked well, you have the results. Enjoy your holiday folks, I'm going to start wrapping up all the LED lights. It seems the dog doesn't really like them after all! Kill A Plant For The Holidays? So really, why do foods fall out of fashion?